As the latest visit to Houston, Texas nears its conclusion, the Oilholic walked wistfully past a petrol station in the Lone Star state. What European motorists wouldn’t give for US$2.49 (£1.61) per US gallon (3.79 litres) to fill up their cars. That was the price was this morning (see left)! Ditching wistfulness and moving on to price of the crude stuff, the latest energy outlook report from the US Energy Information Administration (EIA) sees Brent averaging $61 per barrel in 2015, with WTI averaging around $55. The EIA also expects a decline in crude oil production stateside from June onwards through to September. However, there is little anecdotal evidence here on the ground in Houston to suggest the Eagle Ford is slowing down if activity elsewhere is. Furthermore, feedback from selected attendees at two events here – Baker & McKenzie’s 2015 Oil & Gas Institute 2015 and the Mergermarket Energy Forum – alongside most experts this blogger has spoken to since arrival, point to the said production decline being much less than feared. On average, most opined that we’d be looking at a decline of between 35,000 to 45,000 barrels per day (bpd) this year. It would imply that US production would still stay within a very respectable 9.1 to 9.3 million bpd range with much of the drop coming from North Dakota. As if with eerie timing, American Eagle’s filing for Chapter 11 bankruptcy protection, following its inability to service debt on plays in North Dakota (and Montana), provided a near instant case in point. Overall picture is less clear for 2016. If the oil price stays where it is, we could see a US production decline in the region of 60,000 to 100,000 bpd. EIA has estimated the decline might well be towards the upper end of the range. It comes after analysts at Goldman Sachs labelled the recent oil prices “rally” as being a bit ahead of itself. Or to quote their May 11 email to clients in verbatim: “While low prices precipitated the market rebalancing, we view the recent rally as premature. The Oilholic has repeatedly said over the past six weeks that both benchmarks are likely to stay within the $50-75 barrel range, as the decline in the number of operational oil rigs stateside was not high enough (yet) to trigger persistently lower US production. EIA data and feedback here in Houston supports such conjecture. Meanwhile, the front page of the Financial Times loudly, but bleakly, declared on Tuesday that “more than $100 billion of projects” were on ice with Canada hit the hardest. According to the newspaper’s research, Shell, BP, Statoil and ConocoPhillips have all led moves to curtail capital spending on 26 major projects in 13 countries. Speaking of ConocoPhillips, its CEO Ryan Lance has joined an ever increasing chorus stateside of oil industry bosses calling on the US government to lift its 40-year plus ban on crude exports. At a conference in Asia, Lance told Bloomberg that the Houston-based oil and gas producer had sufficient production capacity stateside to cater the global market and ensure stable domestic supply. Right, so there’s no danger to Houstonians paying $2.49 per gallon to fill up their cars then? To be fair, the ConocoPhillips boss is not alone in calling for a lifting of the ban. Since last July, the Oilholic has counted at least 27 independents, many mid-tier US-listed oil and gas producers including Hess Corp and Continental Resources, and almost all of the majors voicing a similar opinion. They can say what they like; there won’t be any movement on this front until there is a new occupant in the White House. That’s all from Houston on this visit folks, its time for the big flying bus home. Keep reading, keep it ‘crude’! © Gaurav Sharma 2015. 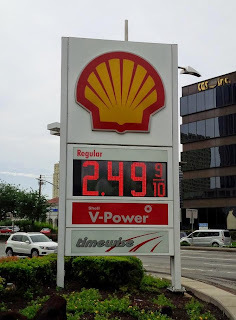 Photo: Price display board at a Shell Petrol Station in Houston, Texas, USA © Gaurav Sharma, May 2015. The Oilholic finds himself in Houston, Texas for Baker & McKenzie’s 2015 Oil & Gas Institute. When yours truly was last in Texas back in February, the mood was rather sombre as leading oil futures benchmarks were still on a downward slide. That was then, what we have now is stagnancy in the US$50-75 per barrel price range which probably encompasses both the WTI and Brent. We are not getting away from the said range anytime soon as one noted in a column for Forbes last Friday before flying out here. Given the nature of such discourse, some delegates here at the Institute agreed and others disagreed with the Oilholic’s take on the short-term direction of the oil markets, especially as a lot is going on in this ‘crude’ world that such industry events are particularly sound in bringing to the fore. The 2015 instalment of this particular Baker & McKenzie event had a great array of speakers and delegates – from Shell to Citigroup, Cameron International to Chevron. The legal eagles, the macroeconomists, the internationalists, the sector specialists, the industry veterans, and of course the opinionated, who never sit on the fence on matters shaping the direction of the market, were all there in good numbers. The situation in Russia propped up fairly early on in proceedings. Alexey Frolov, a legal expert from Baker & McKenzie’s Moscow office, was keen to point out that it was not just the sanctions that were hurting Russia’s oil & gas industry; related macroeconomics of the day was sapping confidence away as well. But Frolov also pointed to a degree of resilience within Russian confines, and a more flexible domestic taxation regime which was helping sustain high production levels unseen since the collapse of the Soviet Union. It does remain unclear though how long Russia can keep this up. Here’s China indulging in something that is really bold, some say unusual. So even if no one is exactly queuing up to buy or lease those Chinese rigs, it is another example that China operates on a whole different level to rest of the natural resources players and participants. As for US shale, people say there is distressed debt out there and the end might be supposedly nigh for some small players. Well hear this – based on the Oilholic’s direct research here in Texas of looking into 37 independent US players, sometimes known as mom n’ pop oil & gas firms, and another 11 mid-sized companies; a dollar of their debt would fetch between 83 cents to 92 cents if hypothetically sold by their creditors. Quite simply, creditors and investors are keeping the faith. But to curb the Oilholic’s enthusiasm, alas Davis added the words “for now”. “You have to remember that many players [both large and small] would be coming off their existing oil price hedges by the end of the current calendar year. That’s when we’ll really know who’s in trouble or not. “However, blanket assumptions that US shale, and by extension some independents are dead in the water, is a load of nonsense. Usual caveats apply to the Bakken players, but nothing I know from clients large or small in the Eagle Ford suggest otherwise,” Davis concluded. As with events of this nature, the Oilholic of course wears several hats – most notably for Sharecast / Digital Look and Forbes. Hence, it’s worth flagging up other interesting slants and exclusive soundbites mined for these publications by this blogger. The subject of oil & gas mergers and acquisitions in the current climate dominated the Institute’s morning session, as one wrote on Forbes earlier today. How to deal with the prospect of Iran’s possible return to the crude oil market also came up. Click here for one’s Sharecast report; treading carefully was the verdict of experts and industry players alike. Separately, a Pemex official described in some detail how UK-listed oil and gas companies were sizing up potential opportunities in Mexico. Lastly, yours truly also had the pleasure of interviewing Anne Ka Tse Hung, a Tokyo-based partner at Baker & McKenzie, for Sharecast on the subject of the LNG industry facing a buyers’ market. Hung noted that the market in Asia had completely turned on its head for Japanese utilities, from the panic buying of natural gas at a premium in wake of the Fukushima tragedy in 2011, to currently asking exporters to bid for supply contracts as competition intensifies and prices fall. That’s all for the moment from Houston folks! Keep reading, keep it 'crude'! © Gaurav Sharma 2015. Photo: A panel session at the Baker & McKenzie 2015 Oil & Gas Institute, Houston, Texas, USA © Gaurav Sharma, May 2015. By all accounts, result of the UK General Election on May 7 was simply stunning. Pollsters got it horribly wrong, Prime Minister David Cameron’s Conservative Party returned with a majority against all expectations, Scottish National Party bagged 56 out of 59 parliamentary seats in the ‘oil hub’ of Scotland - all the ingredients to excite politically minded scribes and the general public alike. The Oilholic began his experience at Ellwood Atfield’s splendid election night bash in Westminster (photo above left) ushering in news of the first exit poll predicting the Conservatives were going to be the largest party with 316 members of parliament. As events unfolded into early hours of the morning and late afternoon the next day, Cameron’s Conservatives returned with 331 MPs and a slim majority putting to bed all talk of a hung parliament. This blogger was up when Labour heavyweights Ed Balls, Douglas Alexander, Jim Murphy and Liberal Democrats ministers Vince Cable, Ed Davey, Lynne Featherstone and Danny Alexander all lost their seats. Resignation of the hapless Labour leader Ed Miliband who managed to deliver his party’s worst election result since 1983 followed, along with that of Nick Clegg, now former deputy prime minister and Liberal Democrat leader. Cameron soon walked back into Downing Street after meeting the Queen and telling her he’d now form a majority Conservative government. Having enjoyed the drama of election night well into sunrise the next day, it’s worth pondering what the result means for the UK’s energy industry in general and the oil and gas business in particular. Afterall, the Oilholic did fret about the direction of the market in his pre-election column for Forbes. For starters, Ed Miliband’s barmy energy price freeze isn’t going to happen. A daft idea, daftly presented to maximum populist effect just didn’t work and is now in the dustbin of political history. This blogger expects ratings agencies to ease up both on UK-listed energy utilities Centrica, the owner of British Gas, and SSE, another service provider as well as the sector in general. Unsurprisingly, both stocks jumped as the entire London market welcomed the result on May 8 morning with the FTSE 100 momentarily returning back above 7,000 points. Nonetheless, Cameron’s government faces a very serious challenge of planning investment towards creaking energy infrastructure – from nuclear to renewables – ensuring the lights are kept on. By some estimates, the required capital expenditure could be as high as £330 billion by 2030. Switching to the mainstream oil and gas business, both the Conservative victory in the UK and an SNP landslide in Scotland are broadly positive for various reasons. As this blogger has noted before, Chancellor George Osborne’s taxation policies turned positive for the industry towards the end of the last parliament, as the oil price decline began to bite North Sea players. Collective measures put into effect back in March imply that the UK’s total tax levy would fall from 60% to 50%, giving a much needed breather to those prospecting in the North Sea. Any further stimulus measures for the better are unlikely to be disrupted by the SNP, even if they do have a broader agenda of roughing up other government programmes both North and South of the Scottish border. This is broadly good for the industry, as it goes through a challenging period and grapples with the restructuring in Aberdeen triggered by companies as large as BP and as small as independent operations services providers. Finally, turning attention to the new energy minister Amber Rudd, a Conservative MP for Hastings, who has been appointed as the successor to Ed Davey; the choice is a great one. Obviously, her credentials are solid or she wouldn’t be here. Gauging the response of the wider industry, most have welcomed the appointment. Rudd is seen as conscientious and hard working minister. Even Greenpeace sent out a release welcoming her to the job, hoping that she’d bring the same energy to implementing the Climate Change Act, as she did to fight the corner of fisheries in her last government remit. With a challenging portfolio, Rudd has her work cut out and we wish her well, especially as she sets about the arduous task of attracting investment to the sector. That’s all for the moment folks! Keep reading, keep it ‘crude’!